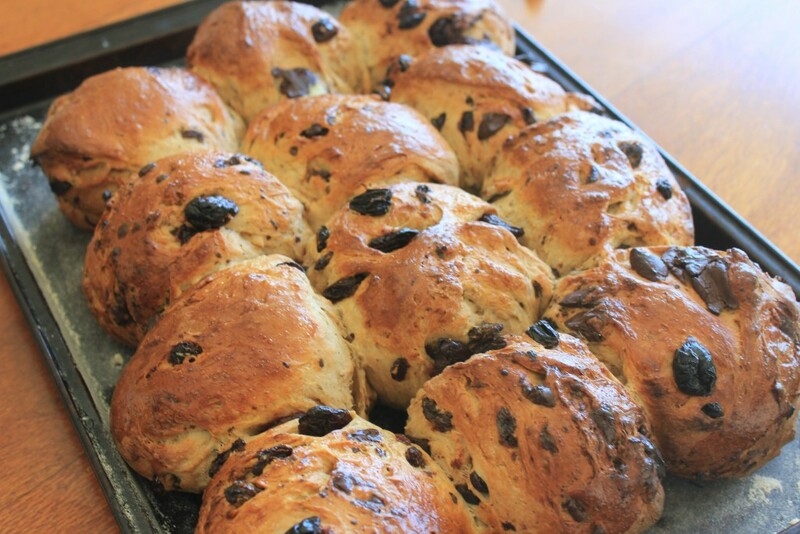 Easter is the time of year for traditional hot cross buns – despite Woolworths and Coles stocking them as soon as the Christmas decorations are removed. I boycott buying them until April! Or, you can make them yourself! I cooked these buns this morning, and they were delicious. Stu told me so at least 3 times in between mouthfuls of hot, butter soaked bread. Baking bread makes me feel really clever and accomplished and this recipe is easy so I can pass that same feeling on to you. I didn’t bother piping a cross on the top or glazing these as per the original recipe because it doesn’t add any flavour but does add additional washing up! Therefore, no point. Henceforth they are referred to as “hot fruit buns”!. When making bread it is best to use bread or pizza flour if you have it because it has a higher gluten content than regular flour. This will lead to a chewier, better textured final product. Sour cherries may be hard to find even if you have a fancy grocer, so you can substitute with cranberries if you like. The packet I bought was short 50g per the recipe, so I substituted sultanas instead. Raisins would be good too! Or even dried apricots… use this recipe as a jumping board to new flavour combinations and let me know what you come up with. Put the flour, sugar, yeast, spices and salt in a large bowl and mix to combine. Stir through dried berries and currants. Combine the butter and milk in a small saucepan and warm until the butter has melted. Beat in the egg with a fork and then pour into the dry ingredients and stir together. You can knead in the bowl if your bowl is big enough and you want to keep your bench clean, or tip the dough onto your floured bench. Knead for about 10 minutes, adding more flour when the dough gets tacky and continue until the dough is smooth. Mind the cherries shooting out from the dough as you knead! Clean your mixing bowl and lightly oil the sides. Place the dough in the bowl, cover and set aside for about an hour to double in size. Dust a baking tray with flour. Punch the dough down with your fist (best part!) and tip onto your floured bench again. Add the chopped chocolate and knead until the chocolate is incorporated into the dough. Cut your dough into 12 equal pieces. Shape each piece into a ball** and place on the baking tray. Cover and set aside for another 30 minutes or so until doubled in size again. Preheat oven to 180C. When the buns are ready to go in the oven, you can glaze the tops with a beaten egg. Cook for about 25 minutes until cooked through and sounding hollow when the base is tapped. ** How to roll rolls – I’m still learning!